I have an affliction of sorts; no matter how fantastic, transcendent a recipe has been or how much I’ve sung it’s praises from the high mountaintops, I almost never make it a second time. I thought I could blame this website, always pushing me forward and urging me to try new! different! shiny! things, but who am I kidding? I’ve always been this way. Though I always say I’m just looking for tried-and-true recipes to laminate, frame, and keep forever, those that will never fail you or me so that I can stop looking, it’s not true. I’m still looking. I’ll always be looking. There are exceptions. In one week, I made the Black Bean Confetti Salad twice, shocking myself as much as my dining partner. There have been two batches of Russian Black Bread because a week without it is a week I don’t want any part of. As summer comes ’round again, I’ll be certain to make a new batch of barbeque sauce and the strawberry lemon sorbet so good, you’ll eat none other again. But for the most part, if I’ve cooked something that you’ve liked, you best stuff yourself good and well with it because you’ll probably never see it again. Poor Alex, right? In recent months, he’s politely requested some repeat meals, from those feta and couscous stuffed peppers, that acorn squash with chile-lime vinaigrette and wild mushroom pirogis, and been denied each time. “But I’ve made that already! I want something new!” Sometimes, fearful of sounding like a broken record, I shift my answer, like when he requested the eggplant, mint and barley salad on Monday. “It seems like more of a cold weather dish!” But not wanting to feel like too much of a green meanie, I set out to find a spring version of it, and ended up making an adapted version of this old Bon Appetit recipe. Actually, I adapted it a ton. First of all, whole beans in a spoke pattern? Scattered lettuce? I confess I don’t have a lot of patience for fusspot arrangements. I don’t care if it looks pretty, if it doesn’t actually add to the flavor of the dish, I can’t be arsed with any of it. Second, I never thought I’d say this, but it had way too much arugula in it, so I ended up only using half. But otherwise, I made the salad somewhat as directed and we liked it. A lot. I mean, it’s really good, a great big bowl of spring flavors, especially alongside the biggest artichokes I’ve ever seen. But it is no minted eggplant barley salad, and it’s not like he hadn’t asked nicely. So if I bump recipes up from the archives here and there over the next couple months, it’s not because I’m not cooking much these days, it’s because I letting my hard work pay off, and getting to eat again what was once phenomenal. In fact, I’m thinking some moules with baked pommes frites are immediately in order. I’m sure you agree. Seving size: The original recipe said it served six, but suspecting it would make much, much more, I halved it, leaving an amount I think would easily serve four people. Cook barley in medium saucepan of boiling salted water until tender, about 30 to 40 minutes. Drain; cool. Transfer to large bowl. 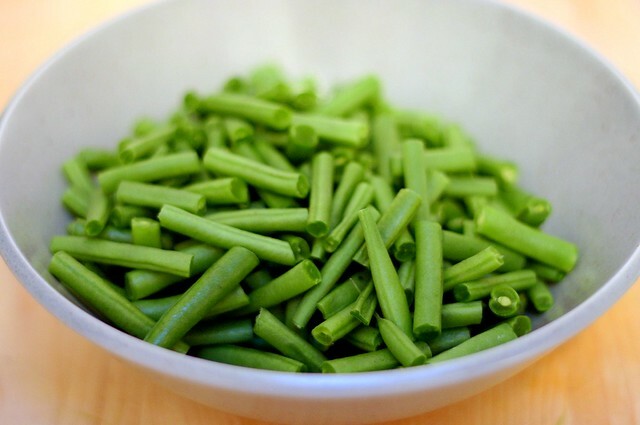 Cook haricot vert in large pot of boiling salted water until crisp-tender, about 3 minutes. Don’t drain water. Transfer beans to bowl of ice water to cool. Drain well. Transfer to bowl with barley. Add corn to boiling water and cook for 2 to 3 minutes, then also plunge in ice water. Dry and cut kernels from cob, then add to salad bowl. 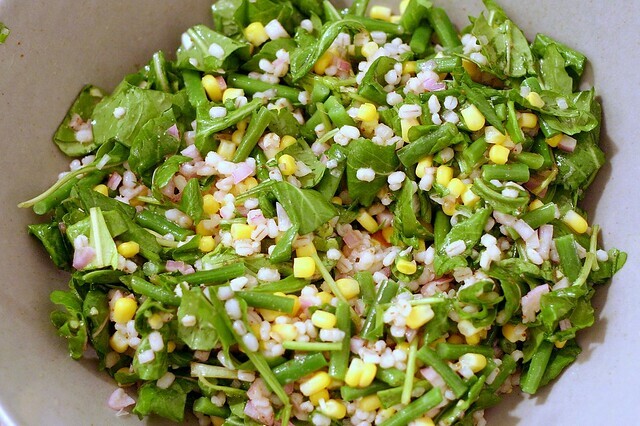 Coarsely chop washed and dried arugula; add to bowl with barley mixture. Whisk olive oil, vinegar, shallots, thyme and Dijon mustard in small bowl to blend. Pour enough dressing over barley mixture to coat. Season salad to taste with salt and pepper. Sprinkle with goat cheese and serve alongside any remaining dressing. You’re starting to sound like me, Deb. One of the reasons I started blogging was so that my wife could follow behind and document what I’d done in the kitchen, so that there was some chance I could make it again. I love making salads with haricots vertes, but I always trade out the grains for bacon. I’m always annoyed when I find an inspiring recipe and I have none, NONE of the ingredients. Must I go to the store yet again?! Tams — What? Where do you get one of those? I mean, I won’t trade Alex in for all that AND a bag of chips, but but but, your arrangement sounds very cool. Rachael — Unrelated, but I forgot to add that I used Cascadian Farms frozen corn. No fresh corn available yet, much to my dismay, especially because I have big, unhealthy issues with corn that comes already detached from the cob… I’ll shut up now. We already know way too much about my food issues. Alicia — What a bummer! I’m sure spinach or another leafy green would do. Lisa — “I always trade out the grains for bacon.” This is why we love you. Brandon — Ha! I go to the store almost daily. It’s out of control. No corn yet? See sometimes it pays to live in Florida. I had some GREAT corn on the cob last week. I had feared it might be too early in the season but it was not! My husband rarely asks for things, and when he does it is either, spaghetti and meatballs, cheeseburgers, macaroni and cheese. Last night he asked for veggie burgers and I almost fell over. I think it may time to go to the next level in meatless entres. Bean and rice burritos maybe? This looks so fresh! So light! So healthy! It looks like the kind of meal that would make you feel, after eating it, that you are good at life. Know what I mean? any idea why my barley doesnt cook up nice and pretty like yours? I follow the directions on the box and its always soupy and the barley is, like, ick. I have to drain it and spread it out on a baking pan.. it gets like, gummy? No advise on the chorizo issue? Amen! Pretty doesn’t equal tasty. I’ve been in many a restaurant where my dinner looked like art and tasted like *#&%! 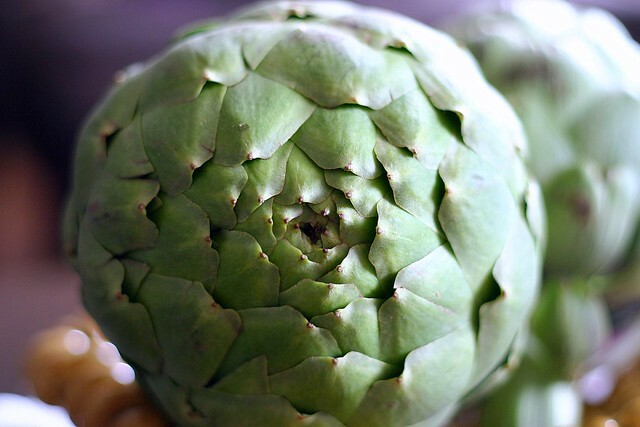 Also, I love the artichoke picture, that thing is a big as a baby’s head! I hope it was utterly delish. Deb, I like trying new stuff too, much more so now that I’m blogging, I’ll admit. New is interesting, challenging, fun and, well, new. But there’s something to be said about the comfort of old favorites. There is almost nothing so homey as familiar, enticing cooking smells, followed by delicious remembered flavors. To me, that’s a big part of what makes home cooking home cooking. I agree, fussy arrangements are usually not worth the effort. Your salad, with its festive array of bright colors and contrasting textures, needs no embellishment. I think heavily arranged foods are an old-fashioned notion, gone the way of jello molds and the like (though I do dabble in cake decorating and I love the stuff at http://www.latartinegourmande.com/). These days, savvy cooks and gourmands know that it’s more appealing if the natural beauty of fresh seasonal produce is allowed to shine. Whether it was what was requested r not, it sounds (and looks) really great.. and spring-y. I am heading to the fresh corn and arugula!! This looks really great! Makes me think of the warmer months we’re heading in to. Yuck! I loved the look of this salad, but it tastes like nothing but white wine vinegar. I totally ruined the wonderful Vouvray we bought to go with it. David — You are absolutely right! The vinegar level is completely and totally wrong. My deepest apologies. I will fix it now, though I’m sure that’s little help to you at this point. There’s a woman in one of my cooking groups who never makes anything twice. I tell her that practice makes perfect — sometimes you need to make a dish over and over in order to really understand and internalize it. Or maybe that’s my rationalization for making the same recipes over and over….! i understand the urge to never make the same thing twice and except for a few staples like beans & rice, pasta sauce, yellow cake with chocolate frosting, i am totally there with you. and this recipe looks good enough to try twice! I made this salad tonight and it is a keeper. I didn’t have pearl barley or goat cheese but I added sliced hearts of palm. My youngest daughter said she doesn’t like Arugula cause it looks likes weeds-she ate it and ejoyed it. Thanks for another good idea!! i made this salad for lunch today and it is divine! love it!! the sweet corn and the bitter arugula are perfectly matched! i have a link on my blog to you because everything i get from here is soooooooo yummy! thanks for a great recipe! I made this last weekend and it was a huge hit! Used feta instead of goat cheese. Thanks, as always, for the inspiration, Deb! I’m confused. I’m new to gluten-free eating- 22 hrs into it to be exact. I read that barley has gluten in it – anyone an alumni of gluten free living that can help me here? Thanks. I love barley but after my lab work & diagnosis, I can’t fool around for awhile, at least until I build my nutrients back up to normal levels. Those little hairs in the small intestines that I dont have that absorb nutrients? I hope they grow back quickly! wow. tasty tasty new favorite for the rotation. I had to cut the oil and the cheese to make it diet friendly, and it still tastes fabulous. can’t wait to try the full-force recipe when I get off my health kick. Deb, your recipe taste is awesome. i’m between this and your pesto, green bean, potato salad as the best deb salad ever. thanks! i love enyrhing that has to do with salads. i served the barley salad for french guest coming over and they loved it. my husbands last name is french, but we’re not at all french lol, but we enjoy this! Question – any suggestions for a winter/Christmas trifle? Maybe with chocolate or gingerbread? Am feeding about 12 people. Thanks! Loving your website! this recipe was fabulous tonight and the goat cheese really puts it over the top. Paired well with shakshuka. Thanks! I’ve just eaten this for the 3rd day in a row and dang it gets better every time! I can see now that it’s going to be a serious contender for my favorite salad, right up there with your Mediterranean Pepper Salad. So glad I found this recipe. Thanks a million, Deb! Oh, btw, Happy Mother’s Day! Give that gorgeous little boy of yours a big smooch for me. LOVED this recipe. I actually liked it better than the minted bulgur salad… Call me crazy :) I made it as is, but doubled it (still used about 3 oz of baby arugula) and used regular green beans, boiled for about 3 minutes. LOVED IT. Hi Deb! Made this to serve to family in town for a lunch while it’s stupid hot here in Ohio (I’m sure it’s not much better there either.) I know this might be a silly question but how do I make barley? There were no package directions so I made it like I would rice. It has a bit more bite to it than I’d want, but it’s still good mixed in with the salad. Can I make this ahead – 1 day before? It will ease my party preparation. I don’t see why not. You can add the dressing at the last minute so it doesn’t overly absorb and seem dry. Do you cook the corn before adding it?? This is a GREAT spring/summer starter or meal. I used haricots jaune to add color and cut back on the olive oil (used 1:1 oil:vinegar ratio) and I paired it with some Dolin dry white vermouth when serving it as an appetizer. It saves really nicely as long as you put the dressing on right before using. Thank you for helping me work whole grains into my summer diet. charlotte — Whoa, can’t believe I never noticed that. I think I cooked mine for a minute (I like mine barely cooked). I will edit that in. Might be better if the barley was toasted rather than or in addition to boiled. To add a nuttier flavor and crunchier bite. This is our absolute favorite salad of summer! I’ve also made it with farro and yellow wax beans – just based on what I already had in my kitchen. It’s delicious every time! I hardly ever comment on blogs — but I had to come here and say that I have had this salad on repeat all summer long. It is SO good! I’ve been doubling the recipe (usually adding an extra ear of corn, too) and assembling everything minus the goat cheese and arugula. I portion it out for work lunches and add the goat cheese and arugula that morning to make sure it stays fresh. I’ve done a few slight variations (omitting goat cheese, adding sliced roasted chicken breast, adding in a few grated summer squash), and it really is just wonderful no matter what. One alteration I always do is that I leave the corn raw — I get my corn from a local CSA and I find it doesn’t need to be cooked. Thank you for the wonderful recipe! I made this salad for the second time last night and everyone loved it. The first time I made it, I doubled the recipe for a big family Easter lunch. A guest at the lunch emailed and asked for the recipe, and last night I wanted to make a nice salad to go with the steaks my husband was grilling. My husband just could not stop exclaiming over the salad- it’s so fresh! What herb did you put in it to make it taste so good! I think it’s the shallot in the dressing…which I thoroughly enjoyed when I had the leftovers for lunch today. Thanks so much for this recipe – I am looking forward to making it with fresh corn and beans from my garden this summer!